* Bet £20 at 2/5 or more for £40 in free bets and bonuses (£20 free bets, £20 casino bonus). Min deposit is £10 and racing excluded from the qualifying bet. Bonuses awarded on bet settlement. Casino bonus has 35x wagering requirement. Unibet are now one of the biggest gambling outlets in Europe. They boast an impressive player database of over 14 million customers and with that has seen the companies fortunes improve greatly. Their acquisition of the bookmaker Stan James just goes to show their intensions from within the gambling industry. Unibet are based out of Malta these days, and alongside their 17 years experience in the industry, have acquired plentiful licenses from around Europe including France, Belgium, Denmark, Italy and the UK, as well as Australia. What’s been impressive to see over these 17 years is how well Unibet have expanded into different sectors of the gambling marketplace. Sectors such as poker, casino and bingo have all been covered, but not only that, they cover them in a way in which they can be some of the best in their class. The sportsbook is very much the bread and butter of the company’s makeup. It was where they first started back in 1999 and it’s always going to be a part of the company where they invest the majority of their time and money. Their 14 million strong player database will likely be made up predominantly of sports bettors, which gives an indication as to how popular the company have been within the sports betting industry. The bookmaker actually have two betting apps that can be downloaded, the first is their standalone sportsbook that has all of their online betting markets to choose from. The second is their ‘Bet Up’ app that includes the majority of the live betting markets. On here you will also be able to see a range of live games and quizzes, making it more informal than the original app. It’s a unique addition to the betting industry and something that Unibet should be commended on! The pricing structure for betting odds on Unibet looks to be more than competitive. We ran a number of markets through Oddschecker.com just to see how they compared and for the vast majority they were always there or thereabouts with the best in the industry. However, we did notice that at no point were they ever best priced, which leads us to think that this would happen rarely on the site. But, considering that they have thousands of betting markets, the selection of just a handful of markets probably wasn’t all that fair an assessment. It is worth noting that on their website Unibet do state their pricing structure has been amended in recent years to become ‘one of the best in the industry’ and whilst we would agree that improvement has been made, they certainly aren’t the best. Their market coverage, as you would expect for a bookmaker with over 14 million customers, is excellent. They have left very few stones unturned with the sports they have implemented into the site and for that they need to be commended. There’s little doubt that football is their main attraction though – no surprises there really – with over 18,000 markets to bet on at the time of writing. In 2016 the sportsbook underwent a massive and much needed redesign. They took apart the old formula and started a fresh, now boasting a truly stunning bookmaker as a result. The live betting section has probably benefitted the most from this with the ability to easily search through the plethora of games that are on offer and easily keep up to date with the latest scores and odds from each. The live streaming section, or Unibet TV as it’s more commonly known, is a fantastic platform for punters to watch a host of live games and matches from around the world. Unibet were actually one of the first bookmakers to offer live streaming and since then have managed to pick some lucrative TV right including leagues such as La Liga, Bundesliga, Serie A, NBA, NHL, tennis and a all UK horse racing. What’s great about Unibet and what we feel really sets them apart is that the bookmaker has much more of a community feel to it than most. For example, they use #LuckIsNoCoincidence on their site and with that comes a plethora of videos describing betting strategies and also some more general sports videos such as trick shots. It’s not going to make you win any more money, but it’s something that really adds to the experience of using the site. On a similar level, Unibet like to get some figureheads from the world of sport to blow their own trumpet about how great the bookmaker is. The most recent addition to that is for England manager and midfielder, Glenn Hoddle. Whilst getting an ex-pro to represent and write articles for a bookmaker isn’t something new, it’s always nice to read how they think certain games might pan out and get the opinion of a former pro. The addition of their cash out section from Unibet has also been a welcomed inclusion into the bookmaker. For those of you that don’t know, cash out allows you to settle bets before the completion of a match to lock in a return. It’s pretty common for most bookmakers to offer this, but always a welcoming sight seeing it there. Unibet are very good at offering both new and existing players exciting offers to get them using the bookmaker. The majority of these are time sensitive, so writing up the offers that they have today right now will be pointless as they might not be available when you come to read this article. But, you can expect to see a number of money back offers and also price enhancements from within the bookmaker. On top of that, they also link in their casino games with their sportsbook, so something like place a £50 bet on a certain football match and get 50 free spins at the slot of the week; you get the idea! The casino section of the site, like the rest of it, has seen a massive overhaul in terms of how the site functions and how it’s been designed. The changes that have been put into place now make it a slick, modern environment for casino players and we have to admit that it’s one of the best looking online casinos that we have come across. Whilst certainly not the most popular part of the Unibet makeup, the casino is probably their fastest growing section and an area of the company that has really picked up pace over the last couple of years. 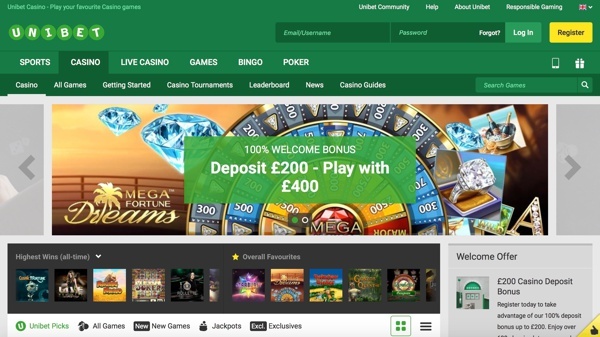 Unibet have gone down the route of using several casino software providers including NetEnt, Microgaming Quickfire, Genesis Gaming, Push Gaming and WMS. In total it gives the casino over 660 games at their disposal, which is about as many as you’re going to find from any online casino. The slots section of the casino is where the majority of games lie and it’s here that includes some great titles such as Starburst, Gonzo’s Quest and the Dark Knight Rises. They also have about 15 or so jackpot games to choose from, but the range that they have might just be the best in terms of jackpot amounts that we have come across. It includes Mega Moolah, Major Millions and Mega Fortune Dreams, which between them are the highest paying jackpot slots in the industry. In fact, at the time of writing the Mega Moolah sot’s jackpot is currently standing at a massive £5.1 million! As you would expect, the mobile casino is a little more understated than the online version, but you’re still getting access to around 160 titles in all. The mobile app also includes progressive jackpot games and a pretty sweet filter function, which is massively helpful in this format. The app can be downloaded on iOS devices from the App Store and also accessed on Android by simply visiting the site in your mobile browser. One of the best things about the Unibet casino is the variation of promotions that they run. Like most of these types of offers, they literally change from one week to another, so we would recommend that you keep checking back on site and seeing what’s on offer. But, for an example you can expect to find things like weekly competitions (in fact, at the time of writing there is a £1million knockout game, which is about as lucrative as you find), Friday night tournaments with up to £25,000 up for grabs and weekend cash cards where the more you find, the bigger the cash bonus you can claim. The poker side of Unibet at one time was probably the reason why they were as popular as they were. These days it’s very much sports betting but the poker room is still going strong and after they launched their own poker network in 2013, the company haven’t really looked back. In fact, the most recent rumors are that they may be taking over the biggest poker room in the world, PokerStars, but that definitely remains to be seen. The bingo room is hosted by software developers Virtue Fusion, who themselves are one of the biggest in the industry. What’s great about Unibet is their inclusion of several jackpot games within the bingo sector. Whilst jackpot games aren’t uncommon, the sheer number that Unibet have provided is pretty rare and a quality addition. The payment methods at Unibet will include a variation credit/debit cards and e-wallets. Some of the more popular ones include Visa, MasterCard, Neteller, Skrill, UKash and Paysafecard. It’s worth noting that you can’t make your first deposit using either Skrill or Neteller and must use an alternative method. 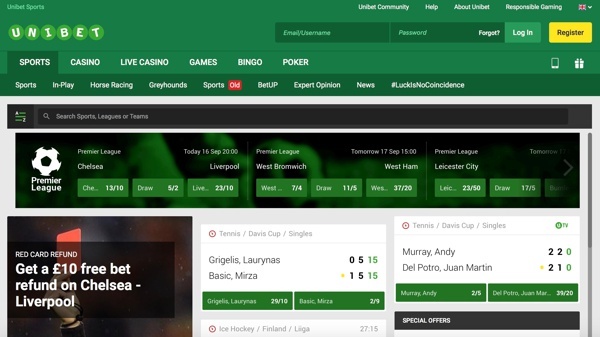 There are several ways in which you can get in touch with Unibet, but you might not be aware that they have a support community where you can post up your issues and someone will usually get back to you fairly quickly. Alternatively, the options below can be used.